Telephone: +34 928 811 762. Home to arguably the best beaches in the Canary Islands, the jewel in Lanzarote's coastal crown is the stunning Papagayo Beach on the southern tip of the island. Set in a sheltered cove, its golden sands are the perfect place to top up the tan and go for a paddle. The late artist, Cesar Manrique, was the architect behind some of Lanzarote’s most outlandish buildings. However, his finest work can be found at the Cesar Manrique Foundation (www.cesarmanrique.com), which occupies the artist’s former home. Typically, this is no ordinary home; Manrique converted air pockets in the nearby lava fields into rooms, where he lived and worked until his untimely death in 1992. If you have a day free hop aboard a sailing boat or ferry in Orzola and cruise to the nature reserve of Alegranza, the most northerly point of the Canary Islands and the only Atlantic nesting spot for the rare Eleonora's falcon. Continue your sailing sojourn with a detour to the tiny volcanic island of La Graciosa, where crystal clear seas and white sand beaches await. The oldest fortification on Lanzarote, Santa Barbara Castle was built in the 16th century to keep pirates at bay. Today it houses the Museo de la Piratería (www.museodelapirateria.com), which offers room after room of exhibits about Lanzarote's cursed relationship with pirates over the centuries. The views are spectacular, too. Lanzarote's most popular tourist attraction, Timanfaya National Park is a protected volcanic reserve formed during a mega eruption in 1730. The volcanic activity continues to this day, much to the delight of diners at El Diablo, whose chefs cook chicken and other Canary island specialities over a geothermal barbecue. If you're not feeling peckish you'll soon work up an appetite hiking in the national park, which features geysers and a unique variety of flora and fauna. The capital of Lanzarote, Arrecife is a small port city, North African in style. Kick back on the lovely and uncrowded Playa Del Reducto beach; head to the pretty Charco de San Ginés for a waterfront stroll and visit Castillo de San José for modern art installations in an incongruously kitsch castle. Explore the rabbit warren of subterranean caves and grottos at Cueva de los Verdes, where visitors will find caverns the size of cathedrals and secret Lord of the Rings-esque passageways. An underground world of extraordinary beauty, do expect crowds during peak season. One of the most photographed geological sights on the island, Charco de los Clicos (green lagoon) is a natural, ochre-coloured pool made all the more spectacular by the black volcanic backdrop. The lagoons is located a short walk from the town of El Golfo, which is well-known for its delicious fish lunches. Lanzarote's golden sands are not just for sun-seekers, you know; the island's windy coastline makes it a magnet for water sports enthusiasts. Playa Las Cucharas in Costa Teguise is a favourite with windsurfers and La Famara is where to go if you like kitesurfing. Surfing is also popular around the island. More César Manrique magic is woven into this natural underground lagoon, which has been landscaped into a fairy grotto. Spiral staircases and palm fronds lead to the shimmering, sapphire pool where tiny, blind crabs live. Tropical gardens, volcanic sculptures, an auditorium and a nightclub add to the appeal of this otherworldly attraction. Designed by Cesar Manrique, the Jardín de Cactus (Cactus Garden) is home to an astounding 1,420 species of cacti, which raise their spiky arms to the sky and punctuate the barren volcanic landscape. A restored windmill gives a window onto the surrounding landscape and there's a pretty café overlooking the thorny garden. At Casa Spinola in Teguise, there's a museum (http://casadeltimple.org) dedicated to the humble timple, a small guitar, a bit like a ukulele, that has been a traditional instrument on Lanzarote since the 18th century. The timple's greatest moment came in 2009 when musician Benito Cabrero performed a show with one at The Carnegie Hall. The island's original capital, Teguise is an archetypal Lanzarote town. Uniform white, single storey cottages line narrow, bougainvillea draped alleyways, and tinkling fountains adorn cobbled plazas. Excellent artisan shops and good tapas bars abound. 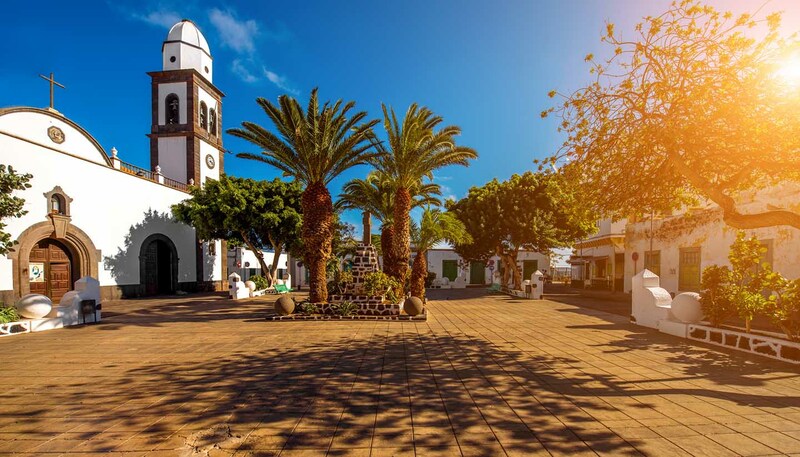 Join the hordes on Sunday mornings for Lanzarote's largest flea market; avoid Sundays if you'd prefer to experience the real Teguise – quiet and traditional.